This interdisciplinary seminar will investigate the life of Nelson Rolihlalha Mandela and the way in which this life has been represented. We will study Mandela’s autobiography Long Walk to Freedom, relevant historical contexts, and several films, both documentaries and feature films (like Invictus and Endgame). We are also likely to read two novels, Something Out There by Nadine Gordimer and The Cry of Winnie Mandela by Njabulo Ndebele, as well as the play The Island, by Athol Fugard. The course will, additionally, consider the nature and politics of apartheid, the history of the ANC and other resistance movements, the experiences of political prisoners, the transition to democracy, and, in order to assess Mandela’s legacy, the state of the “new” South Africa, now 20 years old. Each week’s seminar will be topic-driven, to include recent scholarly debates around on Mandela and tradition, Mandela and the modern city, Mandela and law, Mandela and the armed struggle, Mandela and prison, Mandela and nation-building, the Truth and Reconciliation Commission, and the politics of gender, family, and sexuality (including the AIDS epidemic). 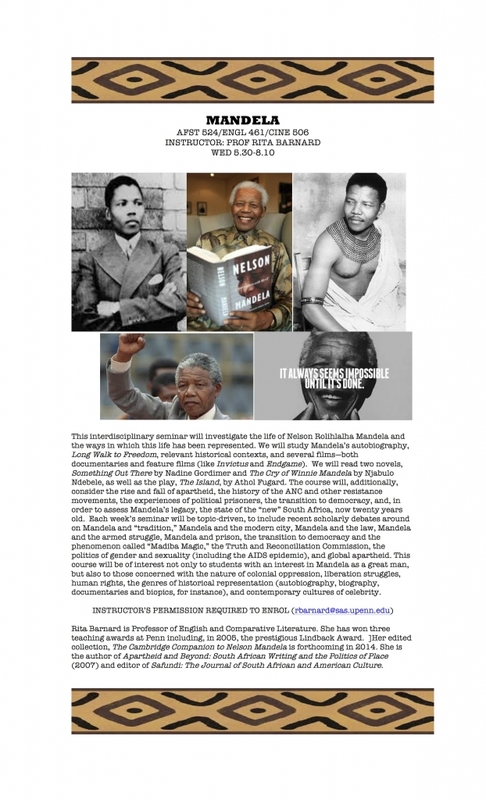 This course will be of interest not only to students with an interest in Mandela as a great man, but also to those concerned with the nature of colonial oppression, liberation struggles, human rights, the genres of historical representation (autobiography, biography, documentaries and biopics, for instance), and contemporary cultures of celebrity.